Dental check-ups can almost always be combined with a visit to our Hygienist to give your teeth a thorough cleaning. Our Dental Hygienist will scrape along and below the gum line to remove built-up plaque and tartar that can eventually, if left alone, cause gum disease, cavities, bad breath and other associated problems. Finally, our Hygienist will polish and floss your teeth and give you advice for your daily routine of cleaning your teeth. Sometimes it is necessary for the Hygienist to deep clean your teeth. This might sound like something you should do after you have missed a few visits to the Dentist or eaten a particularly sticky meal. The term ‘deep cleaning’ is actually a specific procedure performed by us to treat gum and periodontal disease. Quite often the procedure does not get completed in one visit.Usually this happens because the patient has not had regular professional cleaning appointments every six months. At the Surbiton Smile Centre our Hygienist uses an instrument called a probe to measure the area around your teeth to see if you have any pocketing (i.e. the area between the tooth and gum in which bacteria will form). The depth of the gum tissue between the teeth and gums are called pockets when this distance is five millimetres or more. The European Periodontal Association recommends that every adult should receive a periodontal evaluation each year in order to determine whether additional treatment is needed. Measuring pocket depth is just one part of our comprehensive dental evaluation. According to the National Institute of Dental and Cranio facial Research (NIDCR) the depth for normal healthy pockets is ideally no more than 3 millimetres. If the pockets are greater than 5 millimetres, we might prescribe a deep scaling and root planning appointment with our Hygienist. 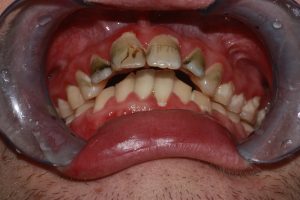 Case Study:In this poor oral hygiene example of a 15-year-old boy you can see that this has led to stains (mould) on his teeth and caused tooth decay. Deep cleaning is also known in Dentistry as scaling and root planning. Scaling involves the removal of plaque and tartar from the surface of the teeth and from the pocket area between the teeth and gums. At the Surbiton Smile Centre out Hygienist is able to perform scaling and root planning using either an ultrasonic instrument or a range of manual scaling tools. The other part of deep cleaning is root planning. Our Hygienist uses a scaling instrument to remove plaque and tartar from the surface of the roots of your teeth. A scaling and root planning procedure requires a minimum of two appointments. A follow-up visit may be necessary to confirm that your gums and teeth are becoming healthier and there is no pocket depth. Ideally, after a deep cleaning appointment, the bacteria in the pockets of the teeth have been removed and in a few weeks afterwards, the gums should become healthier, especially with a rigorous approach to oral hygiene every day. On some occasions an additional mouth rinse is required.We might prescribe an antibacterial mouthwash, to reduce bacteria in your mouth and help the healing of the gum. If the deep scaling and 3-month visits to our Hygienist are not enough to reverse the periodontal disease, then we may recommend you have special treatment by Dr Simin Soltani, our Principal Dentist. She has a special interest in Periodontal Treatment. 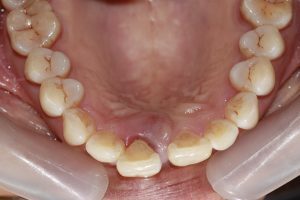 Case Study: Poor oral hygiene if not treated can easily lead to periodontitis and tooth decay. For further information, please refer to the periodontal section of our website. If you suffer from foul-smelling breath, it is usually caused by the breakdown of food by odour-causing bacteria. Other culprits could include poor oral hygiene, dry mouth, periodontal disease, diabetes, tobacco use, alcohol, sinus or throat infections, lung infections, abscesses, kidney-liver-gastrointestinal diseases and / or even severe dieting. Should you have concerns and would like to learn about what is causing your bad breath, then consider making an appointment with us at the Surbiton Smile Centre. By studying your full medical and dental history along with an oral examination we should be able to identify the cause. It is important to carry out effective oral hygiene at home twice daily, by tooth brushing using antibacterial toothpaste and regular flossing to remove food debris and dental plaque on and between your teeth. It is important to include all dental work, paying particular attention to your gum line. What you may not consider is that your tongue surface should also be brushed to remove odour-causing bacteria. A published study reported that tongue and tooth brushing in combination with dental flossing significantly decreased the bleeding of gums as well as reducing bad breath over a two-week period of time. Another clinical study confirmed that brushing twice a day with antibacterial toothpaste and using a toothbrush with a tongue cleaner could eliminate bad breath. There are several toothbrushes on the market, that allow for both the cleaning of your teeth and your tongue. Our Dental staff at the Surbiton Smile Centre would be happy to recommend suitable products to you. After brushing your upper and lower teeth with antibacterial toothpaste, you can then place your toothbrush on the surface of your tongue and then move it forwards toward the tip. After you have cleaned that portion of the tongue, rinse the tongue brush off with warm water to remove any odour causing bacteria. Then place the tongue brush onto the next area of your tongue surface and repeat again. So to recap, the basic strategy is regular daily oral hygiene at home along with professional advice and recommendations discussed with us at the Surbiton Smile Centre. This in turn will lead to a clean, fresh mouth. If you wear dentures, then remember to brush these thoroughly before soaking them at night and before putting them back in.